Here’s the first part, as captured at the Whitley Bay Classic Jazz Party on November 8, 2014. I note with pleasure how happy the musicians look — and that’s no stage joke. The most accurate emotional barometer on this little stage is the visage of one Nick Ball, percussionist supreme: he looks as if he’s going to explode with rhythmic joy. You can imagine how happy I was from behind my camera. More to come. And you might want to investigate this year’s Mike Durham Classic Jazz Party. It’s a place where such things happen — beautifully — throughout a long weekend. In the jam session scenes of films of the preceding century, the two or three trumpet players are always competitive, their horns extending towards the sky, solos played faster, louder, higher. I’m sure this assertive display still goes on somewhere, but the true masters of collaborative creation understand that music is an enterprise where you welcome other players and thus make an audience welcome from the start. Making lifelong friendships in and through music. It was worth the drive to hear one of the bands most effectively committed to a style, a period, an energized way of playing: the music that Clarence Williams and friends made between the early Twenties and the middle Thirties. The Black Diamond Blue Five was created almost two decades ago by the banjoist George Knoblauch, sadly no longer with us, and George’s friends carry on the hot, earnest, deeply felt tradition: Clint Baker, banjo, guitar, vocal; Leon Oakley, cornet; Robert Young, soprano / alto saxophone, vocal; Marty Eggers, piano; Bill Reinhart, tuba, and special guest Isabelle Fontaine, washboard, vocal. Two postscripts. The BDBF also appeared at the 2014 Cline Wine and Dixieland Festival, so more video performances will be gracing your screens before long. And this particular post was motivated by Andrew Jon Sammut’s offering on his THE POP OF YESTERCENTURY, where he focuses on the original Clarence Williams recordings of several of these songs. Jazz flourishes where you wouldn’t expect it, but always amidst its fervent supporters. What follows was one portion of an afternoon concert for the San Joaquin Dixieland Jazz Society, held at an Elks Lodge in Stockton, California. Thanks also to the ladies — not seen on the stand — who make good things happen in hot jazz: Brenda and Jean. The Black Diamond Blue Five will be making another appearance — and they aren’t as frequent as we’d like — at the Cline Cellars jazz extravaganza that will take place in a week at the Cline vineyards in Sonoma, California. Details here. I’ll be there. Good things happen at Cafe Divine (1600 Stockton Street, San Francisco, California) — the food and the North Beach ambiance — but for me the best things happen on the third Sunday of each month, when the Esteemed Leon Oakley, cornet,and Craig Ventresco, guitar and banjo, improvise lyrically on pop tunes and authentic blues for two hours. I posted four performances from their satisfying June 15, 2014, session here. I was taught as a child to share . . . so here are five more beauties, in living color both in the view and the soaring improvisations. Which they do. More Divine Music to come. I received a fascinating letter some days ago from John Cox, a musician from Melbourne, Australia, who has played with Len and Bob Barnard and many other traditional / New Orleans / swing bands. 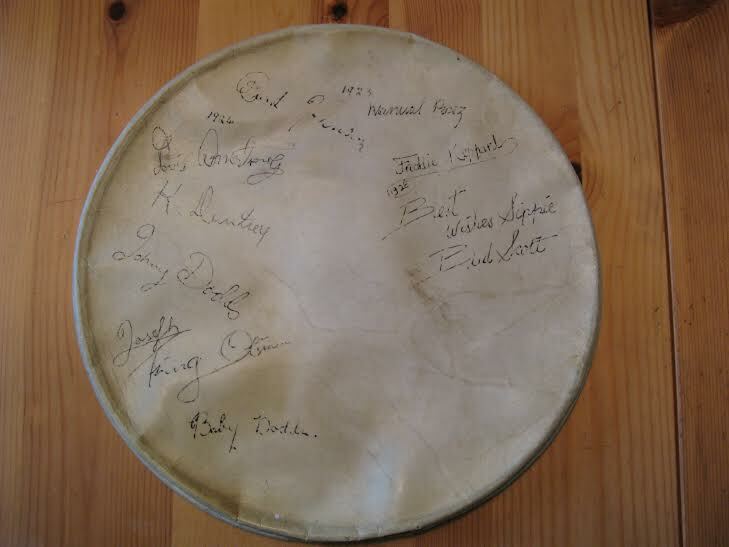 John told me that he has a signed banjo head from the Twenties with members of the King Oliver band, that he would like to sell and have go to a good home. Several New Orleans authorities including Greg Lambousy have said they thought it was genuine. John says he has a Gretsch tenor banjo which the head came from. He’s looking to sell both for a starting bid of $1800 (he has had offers from interested people and institutions) and you can email him at johnpaulacox@optusnet.com.au. I asked John about the provenance of this object, to learn more about it, and to sense its authenticity, and he told me that he bought the head from a man named Sampson, living in Queensland. Sampson told John that the banjo had belonged to his father. When Sampson’s father was about 15, Sampson’s grandfather would take him to the United States from England by ship to New Orleans, up the Mississippi River to Chicago. They would stay in a hotel and get contraband to take back to England. In the hotels were jazz bands, and he befriended Bud Scott, who looked after him and gave him the banjo, which he had musicians sign over the years. The banjo would have been fairly cheap at the time. The boy was nicknamed “Mississippi Sam,” which was shortened to “Sippi Sam.” John believes the story to be true as Sampson’s father had died but Sampson said he could always remember the banjo at the family home. Sampson had come out to Australia as a child and was about sixty when John met him. I don’t ordinarily turn JAZZ LIVES into a hot market, but this object is so enthralling on its own that I felt drawn to do so. Please do get in touch with John if your budget can tolerate the purchase of such a beautiful artifact. Although the physicists explain gravely that time — make that Time — is not a straight line but a field in which we may meander, it often feels as if we are characters in a Saul Steinberg cartoon, squinting into the looming Future while the Past stretches behind us, intriguing but closed off. We anxiously stand on a sliver of Now the thickness and length of a new pencil, hoping for the best. Jazz, or at least the kind that occupies my internal jukebox, is always balancing (not always adeptly) Then and Now. For some, Then is marked in terms of dates: this afternoon in November 1940, or this one in July 1922. The most absorbed of us can even add artifacts and sound effects: uncontrollable coughing, a trout sandwich, the sound of dancers’ feet in a ballroom. But for me, Then is a series of manifestations, imagined as well as real, that have no particular date and time. Bix and Don Murray watching a baseball game. The Chicago flat where Louis and friends drank Mrs. Circe’s gin and told stories. Mezz Mezzrow on the subway. Strayhorn auditioning in Ellington’s dressing room. Mystics Boyce Brown, Tut Soper, and Don Carter, each imagining the universe in his own way. Eddie Condon picking up the tenor guitar. Hot Lips Page shaking a Texan’s hand. Art Hodes and Wingy Manone politely deciding who gets to wear the bear coat tonight. Francene and Frank Melrose having Dave Tough and friends over for a scant but happy meal of rice and peppers. E.A. Fearn making a suggestion. Billy Banks arriving late for the record date. Bird washing dishes while hearing Art Tatum. Joe Oliver having a snack in a Chinese restaurant. Any jazz fan who has read enough biography can invent her own mythography of the landmarks of Then. Now, although it recedes as I write this, is a little easier to fix in time and space, in the way one pushes a colored push-pin through a map. Andy Schumm, cornet and archives; Dan Barrett, trombone; Dan Levinson, reeds; John Sheridan, piano; Howard Alden, banjo; Kerry Lewis, string bass; Ricky Malichi, drums: late in the evening of September 20 at the 2013 Jazz at Chautauqua, now reinvented as the Allegheny Jazz Party. See you in Cleveland, Ohio, between September 18 and 21, 2014, for more of the same delicious time-superimpositions, courtesy of the Allegheny Jazz Party, where such things happen as a matter of course.